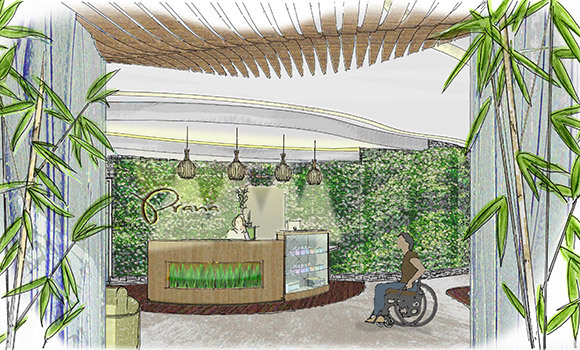 A rendering of the entrance of "Prana Spa." UNCG third-year interior architecture student Kim Young recently won first place in the national Bienenstock Furniture Library Interior Design Competition. Young beat out 39 entries from design schools and programs across the nation – including Virginia Tech and Kendall College of Art & Design – to win the $5,000 scholarship prize. UNCG’s Department of Interior Architecture will also receive $1,000 for its academic programs. Competition participants were tasked with designing a holistic day spa specializing in therapeutic treatment for multiple sclerosis patients. The students were required to design a sustainable, environmentally-friendly facility with a healing environment. Young’s “Prana Spa” incorporates the restorative qualities of nature to create a sleek, soothing design that fosters mental, physical and spiritual healing. Design elements include custom skylights, natural woods, living green walls and textural surfaces. For Young, a non-traditional student who decided to pursue a bachelor of fine arts in interior architecture after having worked in retail management for more than 10 years, the national recognition is a dream come true. 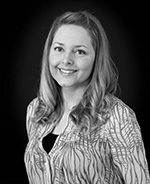 Young began work on the project in August as part of her coursework and submitted the final designs in December. The annual Bienenstock Furniture Library interior design and furniture design competitions – a collaborative effort among the American Society of Interior Designers, the American Society of Furniture Designers and the library – are open to any junior, senior or graduate student enrolled in an accredited college program. Since 1984, the library has awarded more than $400,000 in scholarships. Designs are judged by a panel of industry experts. For more information about Bienenstock Furniture Library, visit furniturelibrary.com. To learn more about the UNCG’s Department of Interior Architecture, visit uncg.edu/iar.